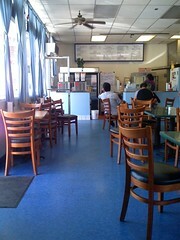 This joint is a stones throw away from Pasadena City College right accross the street. I've been eying the awning of this place when I drive east on Colorado. I figured it was a cafe so I decided to take a looksee. 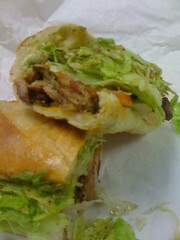 Turned out to be Sandwich Story, whose sandwiches are some of the best value around. You can easily get a meal for under $5. A mom and pop family run operation, very simple place. They tie the whole "story" in their name into the menu with specials called Chapter 1, Chapter 2..etc. Cute. They do sandwiches, some specials like spaghetti, some breakfast items, coffee/espresso and blended drinks/smoothies/shaved ice. Their sandwiches are basic, simple, and not fussy. I know what it's like to be a starving student. It was in college when I really honed my skills in finding those good cheap eats options and staying away from the chains. I can say, that if I were a PCC student, I'd be here all the time. And they have free wi-fi to boot. I've been a few times since discovering this place. 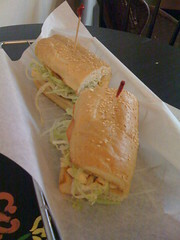 This pic is of the Chicken Almond Sandwich. Get the roll and ask for it to be toasted. I'd come here over Subway any day. From other reviews, it does seem that their hours are very closely tied to the school, which makes sense. So plan accordingly. I was out for/to lunch (however you want to interpret that) and wasn't sure where to go. 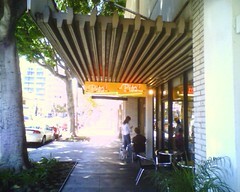 I was close to Fu Shing so I went into the parking lot, but then I saw this cafe hidden toward the back of the plaza. So I went in to check it out and I'm sure glad I found this place. At first I wasn't so impressed by the interior - you have sponged orange-yellow walls, barrels and a couple of water fountains around. I was thinking that the food could go either way by the looks of the joint. There were a few folks eating there and their sandwiches looked great and they had satisfied faces, so I stuck around and got me their signature roast beef sandwich. I got everything and had them do it the way they like to do it. In this puppy they put cheddar cheese, signature dressing, ortega chili, red leaf lettuce, red and green peppers, alfalfa sprouts, and onions (they don't put tomatoes in right now). 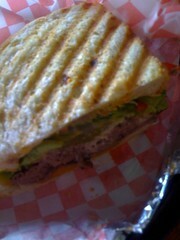 Jammed pack with all that they panini it. This sucker was saucy but good. Totally hit the spot. 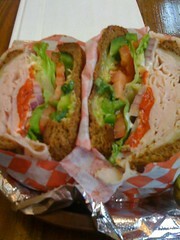 I went back and had me a Turkey Sandwich which has provolone cheese, dressing, fire roasted red peppers, sliced pepperoncinis, red leaf lettuce, red and green bell peppers, alfalfa sprouts and onions - sans tomatoes. They do like 15 different sandwiches and I intend on eating every one of them so I'll be back for more. The other thing that makes the experience here so great is the customer service. These folks are super-friendly and make you feel right at home. With joints like this around, there is absolutely no reason to go to some chain. And, I haven't been, but on Sundays they do all-you-can-eat pancakes. They do have a breakfast sandwich menu and they also do Belgium waffles. I may have to check this out sometime. Mon-Fri: 7am-7pm; Sat: 8am-7pm Sun: ? So I finally got around to eating at Sushiya - after going to La Estrella so many times. It's in the same minimall. This is a classic tiny hole-in-the-wall joint that is not the "best" sushi in the world, but is very serviceable for lunch and is of excellent value. They do a all-you-can-eat thing but its not some lame sushi buffet like Todai - nope you get to sit at the sushi bar and yell out your order and see them make your nigiri. Don't expect to get the coolest hippest decor, don't expect the best customer service, don't expect to get fish flown fresh from Japan or some hard to find seafood, don't expect to find the cleanest space - your table may be sticky, don't expect to come here to party down with Japanese expats, don't expect to be able to entertain a group here. They do it straight-forward here - which is fine for what it is. I was surprised at the size of the sashimi cuts on the nigiri. 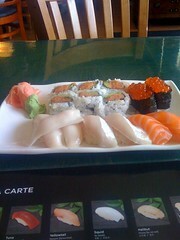 Overall, a very satisfying lunch and I'll be back for sure when I have a hankering for sushi at lunch. 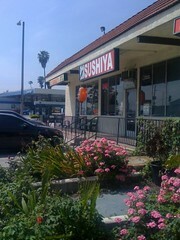 You'll never find me at the Kabuki chain down the street - I mean why go there for sushi, when you can chill at Sushiya? I already did a post on this joint in the past. Since then, I've been coming here at least once a week for lunch. 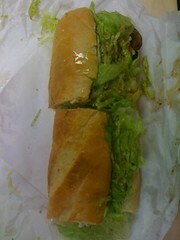 Just wanted to pay homage to their awesome Chicken Hoagie. I first heard about it from one of the blog comments (Thanks BadAss). This is actually a chain with several locations. You won't believe it but they do a 36" pizza. And they have a box for it! Go to the back parking lot and you'll see stacks of them. Unbelievable. I've been driving up and down Colorado but never saw the place until recently. So I stopped by for lunch and they actually do a slice of this big pie. And they have a box for a slice too! 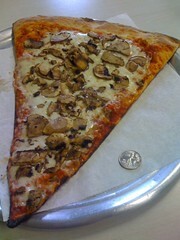 This slice is probably bigger than a personal pizza at any other joint. So I had me a slice with mushrooms. Now I can't say that the pizza itself is my favorite but it was decent and just to witness a slice of a huge pizza pie was worth the small price. The crust is thin but I found the pizza "wet". Could be b/c of the mushrooms. I'll have to try another topping another time. I put a quarter and a regular size pen on the pan so you could get some perspective in the pics. BTW: They actually deliver this 36" pie. And some stats on it from their website: Six pounds of homemade dough, homemade pizza sauce, eight pounds of mozzarella cheese and 100 slices of Pepperoni. The Big Papa weighs about 20 pounds. 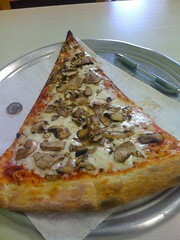 The Big Papa is sliced in about 60 3”X 3” square slices. Been passing by this place for a while so I just stopped by for lunch. It's new - I noticed them last year. It's accross the street from the Post Office. 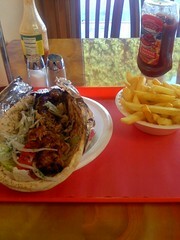 From what I can gather just by looking at the joint from the outside, I was expecting some Zankou wannabe - like Zorbas. But this place was different. It's a clean space but would win no interior design awards. They do have your Rot chicken and falafel, but instead of trying to be another Zankou, they are shooting in the direction of a fast food version of say Carousel or Raffis. 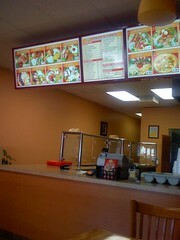 They actually do kabobs, lule, fish (sole), lamb, and lamb chops - which I haven't seen at other joints. I ordered a chicken lule sandwich which included a drink and fries. It was a big sandwich and the entire bill was under 8 bones. Not bad for a lunch. Now, they start cooking on order so if you choose the kabobs, it can take a little time to cook. And as far as flavor, I didn't find the chicken lule as well seasoned and as tasty as say Carousel or Raffis but for a fast food lunch - it hit the spot. I'd certainly come back here for lunch and sample some more stuff. Also, I did notice that they do party platters. This might be of interest for some of the businesses around the area - if they need to feed a bunch of folks at the office. Let's continue on this La Estrella kick. 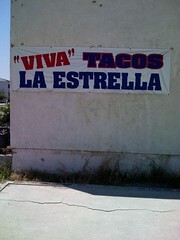 There are many La Estrella locations and taco trucks in the area. I've been to the La Estrella Taco Truck on York Blvd. 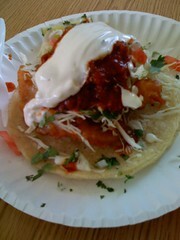 a bunch of times and have been recently visiting the La Estrella Taco Truck on Colorado Blvd. 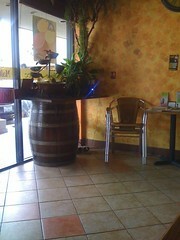 For this post, I visited the La Estrella on Foothill in Pasadena in a small minimall with a small tight parking lot. You may want to just park on the streets on your visit. The thing to try at this particular location is the fish taco. It's not a small affair either so order multiple tacos with caution. You'll find a satisfying mix of heat from the hot sauce, cool from the crema, and crunch from the fried fish batter and cabbage. I don't know what is true or not but I read on Chowhound about the divorce of the husband and wife who ran the La Estrella business. According to the chowhounder, they heard that the couple split but they still get to run different La Estrella locations and the husband got the fish taco recipe in the settlement. I tried tacos with various meats there and they are okay. I'd stick with the fish tacos. Some bad news and some good news. First two bits of bad news: I went by Elements Kitchen for lunch the other day on Fair Oaks and found that they are no longer plating and, instead are serving food in to-go containers. 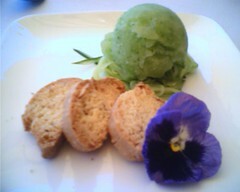 The food is still great but not as well presented as before. Second, I also found out that their plans to move to Eagle Rock are no more. I was really bummed to hear that. I was looking forward to having them in Eagle Rock. In fact, I was wondering why the "for lease" sign was still up on the Colorado building that they were supposed to move into. 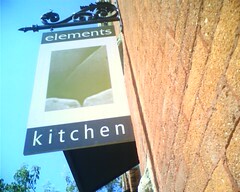 And now for the good news: I found out that Elements Kitchen and Heritage Wine Company are working together now at the Heritage Wine shop location. There is some great food happenning at Heritage - including a Tasting Menu, Dessert Tasting Menu, Charcuterie and Cheese plates. The dishes are not your huge dinner portions, so you can try a bunch of different things and have some great wine too. Go check it out! Drop in for a drink or dinner. 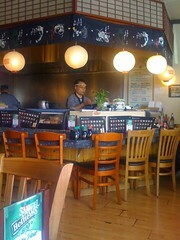 I also heard that on occassional Mondays they do something special - like an oyster bar or a sushi/sake tasting. And apparently they are working on a Sunday Brunch. I signed up for their email lists so I can get the scoop. This partner relationship just happenned like a month ago, so everything is new and evolving. I recommend checking it out and giving them some feedback. 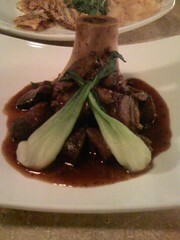 I leave you with some Osso Buco I had there the other day. If I was forced to pick one dish that captured the essence of the season, it would be Elements Kitchen's Cucumber Sorbet - an icy mound of sweet gourd goodness nestled on ribbons of cucumber. A perfect companion for that hot summer day. BTW: Did you hear about Pepsi's recent pilot of artificial Cucumber Soda in Japan? Across the street from Vroman's Bookstore on Colorado, you'll find a courtyard area (AKA The Arcade) with some restaurants and The Nose Wine Cellar tucked in there. I found this place wondering around after I had parked my car accross the street on my way to Vromans. You can add this place to the ever growing list of wine bars. 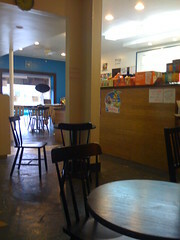 Inside is a wine bar counter with barstools, some tight table seating and another library-like room. Wine bottles all over the walls. Jazz music streaming with low lighting, the ambiance was inviting. It could be a nice place to chill after work for Pasadena-ites. They have flights for tasting. They do have a small food menu - I guess they worked out something with the Thai Restaraunt in the courtyard to make the food. But I didn't try out any of the food. I had already eaten so I was more interested in the sweets. 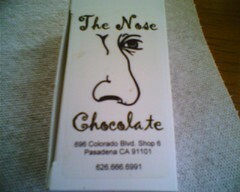 What intrigued me was that they have an assortment of Chocolates. 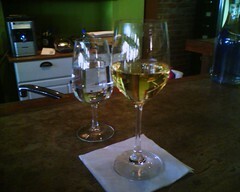 I had to try me some with some dessert wine, and to take some to-go as well. The owner (sorry forgot his name) was explaining how he got a chocolatier from Paris who had moved to LA to make these special chocolates. I got to tell you, the chocolates were pretty damn good. 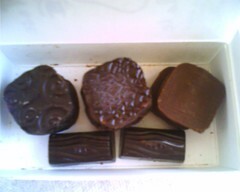 Many of them were herbal chocolates, like a basil chocolate, rosemary chocolate, and thyme chocolate. When you bit into them, you could make out the herbs! They also had Espresso and vanilla...etc. The staff was nice. There were only a few others in there so I don't know how busy they get. With some very expensive wines in the place and with things like custom chocolates in the house, the place can teeter between a sophisticated or a snooty experience depending on the person. The joint is trying to go for a sophisticated wine connoisseur vibe in contrast to say the laid back neighborly vibe at the Colorado Wine Company in Eagle Rock. For my personal taste, I'll be hanging out more at the Colorado Wine Company, but would definitely cruise over to The Nose occasionally to try some different wine selections and try some more of those chocolates. Warning: The website appears to not be updated - since June last year? I was on the prowl for some lunch so I decided to randomly park on Colorado and walk around to see if there was anything interesting around and I found Pita Pita. The front part of this joint is lined with awards, newspaper reviews...etc. The place was packed with people too. I've been looking for some kabob place on Colorado, since both the Zankous on Colorado don't do kabobs. So naturally, I ordered the Chicken Kabob plate. Here, there's no table service. You get in line, order your meal, and get a number. 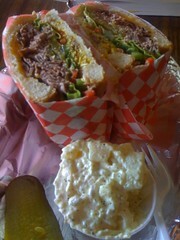 This joint was definitely not a Raffi's Place or Carousel, but more nicer and neighborhood-y than Zankou on Sunset. They had pictures drawn by little kids on the wall. 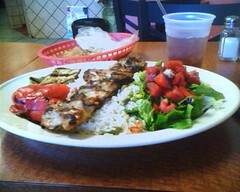 The grilled veggies and the chicken kabob were great. The chicken was juicy and tasty. I wasn't too wild over their "veggie" mixed rice or pita chips. I like the pita chips at Spitz better. But overall, a good lunch. Will definitely come back to try some of the other stuff here when I'm near the area.